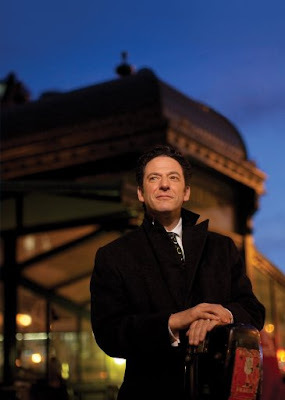 Musicians and music lovers have a lot to thank Dimitriou’s Jazz Alley for, but John Pizzarelli mostly appreciates the Seattle apartment the club provides performers, equipped with the kitchen where he first got inspired to cook. A kitchen means a lot to a guy who spends 150 days on the road each year. Pizzarelli isn’t playing the Alley this time around, though fans see him there often. This week, the New York-based jazz vocalist and guitarist will be “cooking” at the Edmonds Center for the Arts, where he’ll perform Thursday. As artistic director of the three-day DeMiero Jazz Fest, he’ll also host fellow greats Freddy Cole and Karrin Allyson along with local luminaries like Greta Matassa (ticket info here). With his quartet — including his bassist and brother Martin Pizzarelli — he’ll spend his days at student workshops. Unfortunately, he won’t have a kitchen to cook in, though he hopes to find time to visit some of his favorite restaurants: Cafe Juanita, Palace Kitchen and Salumi — the Batali family’s Pioneer Square sandwich shop. Weaned on Italian food, Pizzarelli was inspired to cook not by his mother (who’s since taught him to make a mean eggplant Parmesan), but by Federal Way homeboy Molto Mario. “I’m a cover band for Mario Batali,” said Pizzarelli, known to whip out the chef’s “Babbo Cookbook” and whip up multicourse pasta meals for family and friends. Leson: So, do you have a fancy-pants kitchen? Pizzarelli: At home in the city you can almost have three people in it at the same time and actually have a conversation without saying, “Can you move, please!” Here at the cabin, the kitchen’s tiny, but I love it. We have a 30-inch stove, but when the next record goes over the top, I’m hoping to get a Viking. NL: When I’m cooking, I listen to you. When you’re cooking, what’s playing? JP: Benny Goodman from the White House — from a tape I converted to a CD. It’s from when Reagan was president. My father [legendary jazz guitarist Bucky Pizzarelli] worked the gig. King Hussein was there, and he was a big fan of Buddy Rich, so they got Buddy to play drums. NL: When you perform, you interpret Irving Berlin, Antonio Carlos Jobim and my favorite — Springsteen croaking “I Like Jersey Best.” But when you’re wearing an apron instead of a guitar, what’s your standard repertoire? JP: I can make and freeze three or four pastas — from tortelloni to tagliatelle — in a few hours. It’s part of my meditation. I can do it boom, boom, boom, which is different than putting out a plate of ziti and chicken parm, though I can do that, too. NL: You’ve got pizza in your name. Ever make it at home? JP: We’ve got this Rolls-Royce Weber. We put a pizza stone on the grill, then close it; you can get it cranking up to 600-700 degrees and get it killing in there! NL: Your favorite cooking implement? And what, besides that Viking, is on your wish list? JP: Can’t live without my pasta strainer. Wish list: a chitarra — the guitar-shaped pasta cutter. NL: OK: Best food lyric?